Aleida brings a lot to the table at Ella & Oz. She received extensive education at Gene Juarez Academy and graduated in 2013 where she was lauded with an award commemorating her expertise and team involvement. She then went on to complete a comprehensive apprenticeship with a master stylist. Aleida is inspired and dedicated to her craft. She revels in opportunities to create unique haircut styles, fashion-forward coloring, gorgeous updos and bleach & tones. 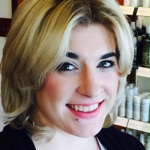 She is a Pacific Northwest native who relishes her role in assisting men and women to discover new levels to their attractiveness and beauty.